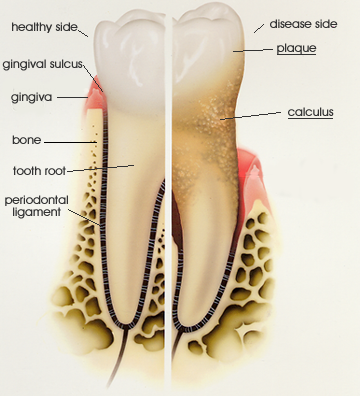 Periodontal disease affects your gums and the bone that surrounds the teeth. Specialized periodontal care is sometimes necessary to maintain healthy gums. The most common issues affecting gums are chronically inflamed gums, recession of bone supporting the teeth, gum recession, esthetically challenging gum anatomy. Please schedule an appointment with us if you have gums that bleed when you brush or floss, uneven gums, loosened teeth, bad breath, or gum or bone recession around a tooth/teeth.